1) Onyx (#31345) with 304 snowballs thrown! 2) Kubbub (#20090) with 240 snowballs thrown! 3) Wulfraptor (#170) with 143 snowballs thrown! 4) Pacifiction (#30722) with 85 snowballs thrown! 5) Sam (#6137) with 79 snowballs thrown! The winning club of Club Wars this year was the Tooth club!!!! All users who defeated over 50 enemies and belong to that club received 2 scales - all other clubs with users who defeated more than 50 users received 20 tokens! Wooo! 1) Sunita (#134) with 9 infections! 2) Wulfraptor (#170) with 8 infections! 3) Adflicta (Nyx) (#6118) with 7 infections! 4) QERSJI (#24445) with 5 infections! 5) Kubbub (#20090) with 5 infections! Not much happens in March so we're just going to do a couple of mini-events to keep everyone on their toes. Starting today our lovely trash pteranodon is going to show off her uncanny baking skills and start giving out pies and er - pie shaped objects - in celebration of Pi Day. She's really trying, okay? She has enough to last about 3 days! Afterwards, we're going to be acknowledging seasons are changing and with that comes a lot of colds and aches. Healthy items, such as the elusive Orange and Green and Red Pepper items, will be given to our dear pteranodon to hand out. More rarely, items that permanently remove genetic issues will be distributed as well. So in short, for the next week, keep a keen eye on the nest! Thank you everyone for helping us out for the Valentines Event! In first place we have Zani - #2255, who received a Sack of HerbiFertilizer, a Chocolate Oyster, a Terror Bird Egg, and 30 Scales! In second place we have Brother Woodchuck - #21071, who got a boosted prize, since a mod ended up taking first. They got a Sack of HerbiFertilizer, a Chocolate Oyster, a Terror Bird Egg, and 20 Scales! 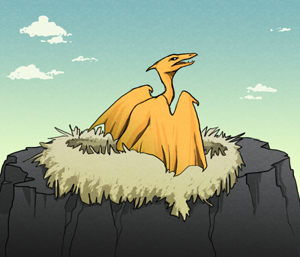 In third place we have Karasume - #19356, who received a Sack of HerbiFertilizer, a Terror Bird Egg, and 10 Scales! and to thank you for your patience with us again this year, we awarded the two runner-ups, tt - #86, and Blaster #14030 a prize of 5 Scales each. Everyone who posted in the previous thread received 1 Scale for helping us out! Since the site has some automated processes that we don't completely have access too, we're hoping you all can help us out a bit to sort out the Valentines event. If you can remember or guess approximately what your egg total was at the end of the event, we'd love to have you post your total on this news post! In thanks, we'll give everyone who posts something a scale for being such patient souls with us. With this, you can add a lake to your herbivore enclosures permanently! One lake will water 80 herbivores automatically so you don't have to worry!